American interventionism in Libya and Syria. During the Obama administration, beside the war in Afghanistan and in Iraq, US armed forces had carried out military operations in the theatres of war in Libya and Syria. The conflicts began as consequences of the so-called Arab Spring in 2011 in Libya and Syria and the political fragmentation due to the weakening of the local governmental authorities. Nonetheless, American interventionism in those two theatres was substantially soft, as in both countries was neither planned nor implemented an invasion, as much as the presence of military detachment on the Libyan or Syrian soil. The outcome of these two intervention – the one in Libya already finished, the one in Syria still continuing – probably constitutes Obama’s heaviest political-military legacy to the next President of the USA, Donald Trump. American intervention in Libya: its genesis, its outcome. Following the protests against authoritarian governments in most Middle-East and North Africa, Libyan people started to protest against the authoritarian government of Colonel Muammar Gaddafi on February 2011. Gaddafi reaction to the protests has been extremely violent and the protests soon turned into a civil war. In this context, it was not the USA to have taken the initiative against Gaddafi but France. International community’s pressure against Gaddafi determined the UN Security Council resolution 1973 that gave way to a NATO coalition and a military intervention against the Libyan dictator. Ultimately, American-led NATO intervention in support of Libyan insurgents determined the fall of Gaddafi’s 41 years old longstanding regime and the capture and assassination of the Colonel by the insurgents. Nonetheless, NATO military interventions aimed only to destroy the Libyan armed forces without a direct intervention with troops on the ground, the latter a feared solution because of the experience in Iraq after the Second Gulf War, and the employ of soft power in order to harmonize the political views of the insurgents and rebuild a more democratic Libya. By 31 October 2011 NATO operations had come to an end, leaving room for the process of peace. However, the peace process never took off, as the fragmentation of the anti-Gaddafi front has never been able to find a solution for the country and, especially, to fill the vacuum left by the overthrown of Gaddafi. After the war in 2011, the situation became extremely jeopardised and could count with the presence of ISIS forces in different parts of the country, especially Derna and Sirte, the latter hometown of the deposed dictator. American position towards the conflict in Syria. Summarizing the genesis of the conflict in Syria and its evolution until nowadays would be too long and beyond the purpose of this post; the Arab Spring in Syria and its consequences have already been analysed here in Changing World, as much as the main elements of the conflict that followed the reaction of the Assad regime against the Syrian protesters. Taking into consideration mainly the American intervention there, it can be said that the Obama administration was characterised largely by hesitation, mainly because, at the begin of the Syrian conflict, intelligence in the White House assessed that the Assad regime would have fallen alone under the pressure of the protests and the ongoing conflict. Nevertheless, the resilience of the Assad regime proved to be stronger than thought; furthermore, the support that the Syrian regime received from Russia and Iran plus the fragmentation of the forces against it created a complex situation that worsened the conflict and induced the American to intervene. On 18 August 2011 Obama asserted that Assad had to step aside ‘for the sake of Syrian people’. However, the Obama administration resolved only to aid some moderate rebel groups with non-lethal equipment, i.e. food, medicine, and logistical equipment such as pick-ups, while the CIA was carrying out covert operations to fund and support with weapons and training some of the groups fighting against Assad; finally, Obama disposed financial funds to the Free Syrian Army. In general terms, Obama refused to arm larger groups of Syrian rebels despite the proposal formulated by the former Secretary of State Hillary Clinton; however, since 2013 American support to rebel groups has been more significant including lethal equipment and training. Finally, since September 2014 a direct US intervention in the Syrian theatre took place; however, American intervention was directed against the positions of the so-called Islamic State in Syria in the code-named Operation Inherent Resolve, and did not aim to support the anti-Assad rebels and their efforts against the regime. Since the begin of this military operation 6,191 airstrikes have been performed by US Air forces in Syria. War in Libya and Syria: Obama’s legacy to Trump. In an interview for Fox news, Barack Obama said that his administration worst mistake was “probably failing to plan for the day after what I think was the right thing to do in intervening in Libya”. The actual situation in Libya shows a country barely controlled by the local authorities, jeopardized, and with the ISIS threat on the rise. From this point of view, Obama’s words say the truth, as after the military intervention the United States and the UN have been unable to plan a post-Gaddafi Libya, leaving a vacuum that has been filled by local warlords and ISIS followers in a process that resembles Iraq after Saddam Hussein; moreover, the American intervention in Libya can be considered as fundamentally a military one in a NATO coalition, since the political burden of the conflict was taken by UN: in this sense, one can say that American involvement in Libya was at a certain point secondary. Nonetheless, the situation in Libya is far better than Syria’s. In the latter case, American intervention has been hesitating, too soft and finally not oriented to put an end to a civil war that has already killed hundreds of thousands civilians and displaced millions of refugees, but to counter the expansion of ISIS in that country mainly by airstrikes. It has to be said that the political-military conditions for an American intervention against Assad were far more complicated than Libya’s: Assad could count on the support of Russia and Iran, the Syrian Army were in much better shape than Gaddafi’s and Assad had – and has still now – a bigger approval rate within Syrian people than Gaddafi with his own people. As it has been stated, Obama’s degrading of Syria as a secondary theatre for American interests is a gamble whose consequences could be far worse than supposed by him, involving the American pre-eminence in Middle-East. To this and to several other questions regarding North Africa and Middle-East, Donald Trump will be compelled to offer a solution, if not at least a plan. 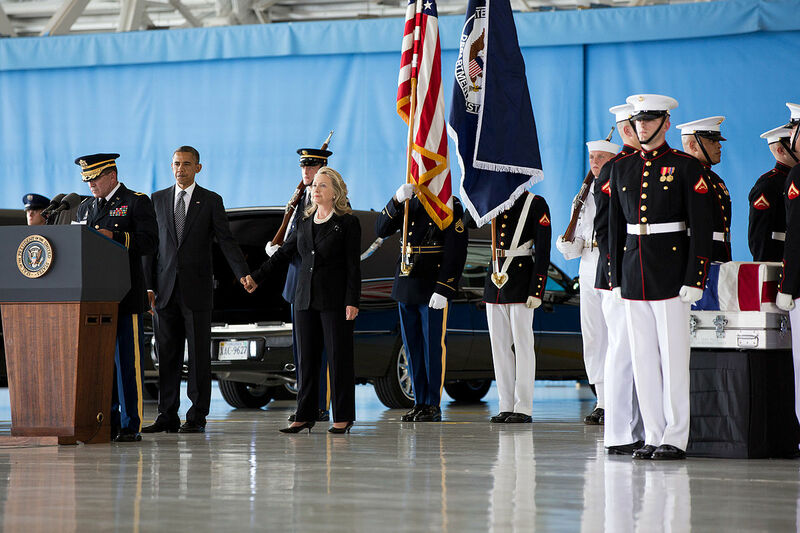 Barack Obama and Hillary Clinton honoring the Benghazi victims at the Transfer of Remains Ceremony, 2012. Photo by Pete Souza - White House / Public Domain.